For Japanese people, there’s a custom of buying souvenirs whenever they travel somewhere. “Omiyage”, or souvenir, refers to goods or gifts that are associated with the traveler’s destination and are purchased to be given to acquaintances and relatives. Many people end up buying things to give to their neighbors, friends, or co-workers to tell them, “this is where I went”, rather than buying it for themselves. 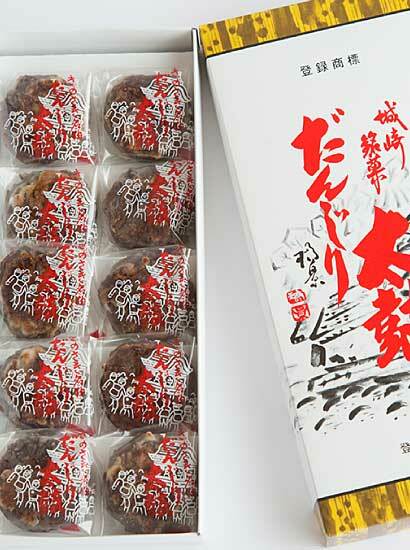 So individually packaged sweets or traditional Japanese confectionery are popular because they are easy to handout. I would say that it is also customary to buy something for family and co-workers even if you are just going on a business trip. Souvenirs to the Japanese are more than just trinkets, they are a way of telling people of where they have been. Now, you must be thinking “Why buy something for someone else?” and “Isn’t this a trip for my own enjoyment?” Right? Well, I would like to propose this to you. If you are traveling all the way to Japan to experience the culture why not also try the culture of Japanese traveling and see what it is like from a Japanese person’s perspective? Seeing the surprised and excited faces of your family and friends when they receive a souvenir from your travels just might become your newest habit. Now, please let me show you my recommended “omiyage”. You can find many souvenir shops lining the streets of Kinosaki Onsen, especially along Ekimae Street and Yunosato Street. At these shops you can find traditional Japanese confectionery, local foods & sake, as well as small and large towels perfect for the baths. Not to mention various goods made by local industries like Toyooka brand name bags and traditional straw craft gifts just to name a few can be found. Recently, a “hon” or specialty book which can only be purchased at Kinosaki Onsen has joined the list of Kinosaki specialties. Books and novels are synonymous with Kinosaki Onsen. About 100 years ago the novelist Naoya Shiga spent some time in Kinosaki Onsen and wrote the novel “Kinosaki ni te (At Cape Kinosaki)”, this novel then circulated the name of Kinosaki Onsen nation wide. More recently contemporary writers Manabu Makime and Kanae Minato have also published novels set in Kinosaki Onsen leading to the town becoming a topic of talk again. Sorry, getting back to the topic of souvenirs from Kinosaki Onsen, “Danjiri Taiko” is definitely a good one. 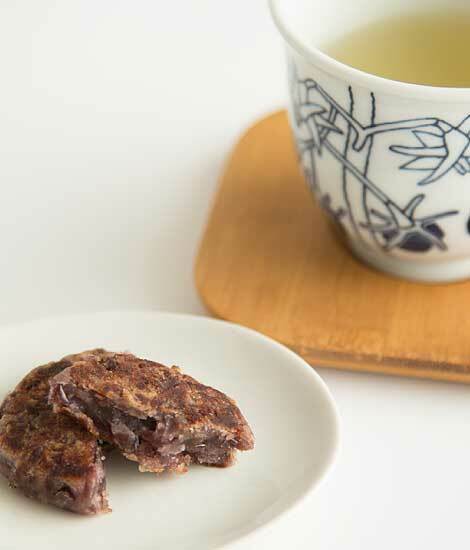 It is a mildly sweet tsubuan (sweet been paste) wrapped in a thin coating that is then baked on both sides. Many of the local inns select this confectionery to serve with their tea to welcome guests. The name comes from the “Danjiri Festival” that is held every autumn. I won’t go into detail about the festival because it would take too long, instead I’ll save that information for your next visit. But I will tell you that it is shaped round like the taiko drums used in the “Danjiri Festival”. Local confectionery shops have been making this for over 50 years. They have been making it by hand for years and the look or taste hasn’t changed, a simple look and simple taste. It’s soft but chewy texture is habit forming. Of course it goes well with Japanese tea, but I surprisingly find that it also goes well with coffee. And you can’t beat the price, 760 yen for a box of 10. And the fact that they stay good for a month makes it a great souvenir for those long trips. By the way, when visiting any hot spring town in Japan it is very typical for one to say “I’ll buy some manju on my way back from the onsen.” and then buy them (steamed bun, traditional Japanese confection) as a souvenir. So don’t forget your manju souvenir when you go. If you are looking for a souvenir for yourself, I recommend a “Yu Shaku (hot spring bath ladle)” and illustrated hand towel from Onsenji Temple, the hot spring temple. Here’s why. Kinosaki Onsen is said to have been started by Saint Douchi, a holy priest thought to be an incarnation of Jizo Bodhisattva, about 1300 years ago and taught the bathing method of “the old bathing ways”. In the past, when you came to Kinosaki Onsen and before you could enter the baths you would first need to visit the hot spring temple Onsenji and pray to the spirit of Saint Douchi, learn the proper way to take a bath and receive a ladle. All of this needed to be done before immersing in the hot springs. Then after using the ladle to bathe you would return the ladle to Onsenji Temple and thank the priest. In other words, the entrance ticket for the baths in those times was the ladle. Of course you don’t need the ladle or need to do all of that to enter the baths now. But, to share the history and honor of the old ways to people you can purchase a ladle and hand towel illustrated with “the old bathing ways”. This is a one of a kind item you can only get in Kinosaki Onsen. Feel free to come and get one to commemorate your trip. Or, for another idea, why not send yourself or someone you know a postcard? Great for those who said “I don’t want anything that will take up space.” Just buy a postcard from a souvenir shop, write your message, get a stamp at the local post office and to make it even more special ask the post office staff “Fukei Shirushi wo Onegaishimasu” (Please put a landscape stamp on it.) “Fukei Shirushi” or landscape stamps are special postmarks of local symbols, landscapes or landmarks that you can get at the post office. They are rare collective stamps that you can get only if you request them at the counter. But not every post office in Japan has something like this. 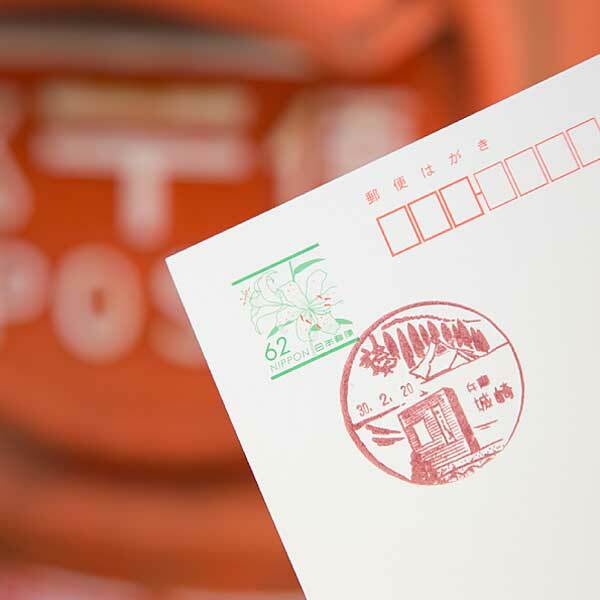 Kinosaki Onsen’s post office is one of the ones that does and the stamps are of scenes around Kinosaki Onsen. And they are pretty nice designs as well. A great gift that doesn’t take up space, is reasonably priced and would be appreciated by the recipient. I highly recommend this one.